Our society is obsessed with zombies. There are multiple zombie based tv shows, films, video games, board games, there are even zombie themed restaurants (Because apparently eating a regular hamburger at a regular hamburger shop wasn’t good enough for you). I’m not saying of there are a couple of examples I am saying there is a hoard of examples, a hoard that is slowly surrounded us in a barn while we were all too busy interneting and swiping right. There were over 50 zombie movie last year! There were over 20 zombie board games that came out last year. Most people don’t even know that 20 board games come out in a year, much less with the same theme. 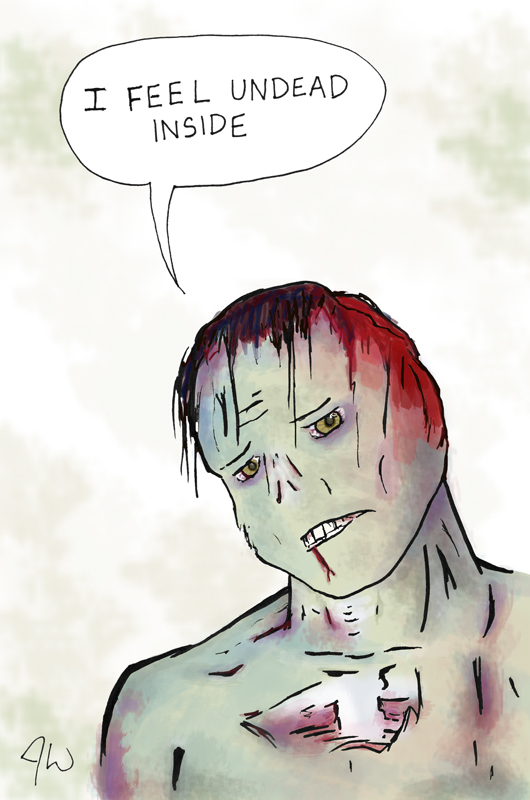 Hell, we like zombies so much we add it to intellectual properties that normally don’t have zombies. I’m looking at you Pride and Prejudice. And I think that statement might annoy me more than anything else. “It’s all about the people.” I thought that was the whole reason we started using zombies. Zombies don’t have care or emotion unlike vampires or witches, zombies exist as a mindless threat so you can focus more on the survivors. Just look at a film like Night of the Living Dead, wether it was intentional or not, Ben being a black man was a very important part of the film, even more important, in my opinion, when he is shot in the end of the film. 28 Days Later has the King Kong ending where we are the monsters (To be fair the zombie are also monsters too). So I guess my geek advice is: Don’t worry if you like something with zombies. You don’t have to qualify it with, “I normally don’t like zombie thing but…” With any medium and genre there is a good chance that some of it will be good and some will be bad, some pointless (I’m looking at you Organ Trail) The thing you should avoid is being so open about your hate for zombies. This year the card game I Hate Zombies is coming out. Why? If you hate zombies why did you make a zombie game? I know it’s because you like zombies but still want to appear to be like the cool kids that hate zombies, or you think your consumers are mindless creature that only want one thing… brains, I mean zombie things.